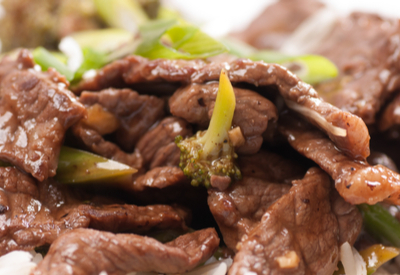 Asian Beef and Broccoli Recipe - Better Than Take Out! Asian Beef and Broccoli Recipe – Better Than Take Out! 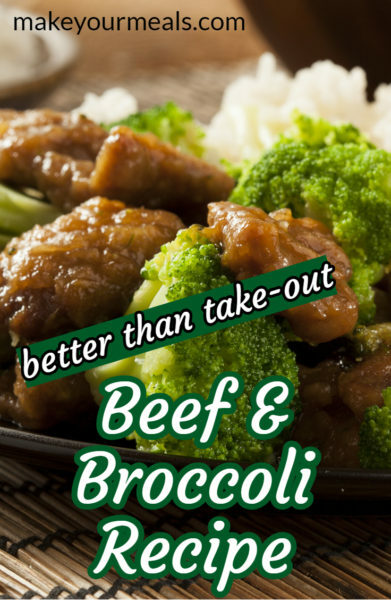 Beef and broccoli is a classic dish served at nearly every Chinese restaurant in the United States. It is one of the most common menu items ordered and is definitely a favorite in our family! 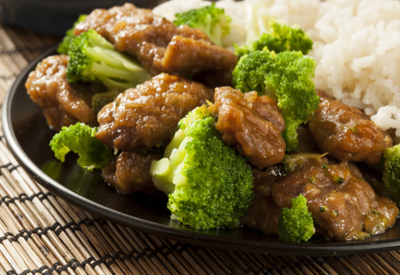 Our go-to Chinese restaurant meal – Beef and Broccoli served with steamed rice. Tender strips of beef are marinated and cooked in a succulent brown sauce. Add in bite size pieces of tender, yet still crisp, broccoli florets and you have the base of your meal. Served over fried or steamed white rice and you have a classic Asian Beef and Broccoli dinner! We use flank or flat iron steak – it’s economical and becomes tender and juicy during the cooking process. One of the most common questions that we get when making this recipe for family and friends is what type of beef do you use? The beef is so tender that it melts in your mouth. Everyone assumes that it must be from an expensive cut of prime choice beef. However, we have used two different, inexpensive, cuts of beef for this recipe and both have turned out wonderful! We use either a flank or flat iron steak. Both of these steaks are traditionally large, fairly tough pieces of meat. However, when cooked right, they will turn into tender medallions. The secret to tender and juicy beef is how you take care of it before and during the cooking process. The marinade tenderizes the meat and the sauce adds a rich flavor to this meal. You must use the perfect combination of ingredients to make the marinade. This will allow the flavors to not only penetrate, but to tenderize the meat. Some acidity is required to break down the fibers of the steak and allow the marinade to soak into every crack and crevice of the beef. We use both soy sauce and rice wine in the marinade to help tenderize the flank or flat iron steak. It is important to know that Rice Wine is different from standard wine and much different from rice wine vinegar. They are NOT interchangeable. Rice wine can be found in the Asian section of most grocery stores or on Amazon (see affiliate link here: Rice Wine). However, in a pinch you could substitute dry sherry for rice wine if needed. Bite size pieces of broccoli tossed with the sauce. We prefer to marinate our beef for at least 4 hours, although we have also had good results when it has been marinating for just one hour as well. And the final key to getting tender and juicy beef – don’t over cook it! 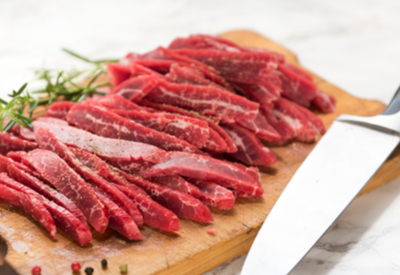 Because you slice the beef in thin strips, the cooking time is merely completed in minutes! The traditional way to serve Beef and Broccoli would be over a bed of steamed or fried rice. However, in order to make things a little healthier, we often serve it on top of Cauliflower Rice or eat it as a stand alone main dish. Of course, in order to make believers out of your family and friends, you could make it appear like true take out by serving it in to-go containers. But you better not forget the fortune cookies! A classic Chinese take out dish that is easy to make at home and tastes even better than your favorite restaurant. 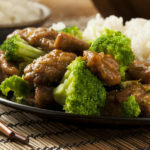 Thin strips of flavorful beef paired with crisp, yet tender bite size pieces of broccoli that are both smothered in a delicious homemade brown sauce. Slice the beef into thin 1/8 inch slices. Cut each slice into 2 inch length pieces. Pour the cut beef in a gallon size resealable plastic bag. In a medium bowl, mix the marinade ingredients together using a whisk. Pour the mixture in the bag with the beef. Be sure to coat and massage the liquid directly onto the beef. Marinate for at least 1 hour in the refrigerator. Right before making the beef and broccoli add the sauce ingredients into a small bowl and whisk until well incorporated and set aside. In another small bowl, add garlic, ginger, red pepper flakes and 1 teaspoon olive oil. Set aside. In a large, non-stick skillet, heat 2 teaspoons olive oil over high heat. Working in single layer batches, add beef to the hot skillet. Cook 3-4 minutes, turning 2-3 times until just cooked. You do not want to overcook the meat. Transfer to a large platter and cover. Cook the remaining beef strips and when cooked, set aside. In the same skillet over medium-high heat, add 1 tablespoon of olive oil. Once hot, add the broccoli and sauté for 30 seconds. Add beef broth, cover pan with a lid, and turn the heat to medium. Continue to steam broccoli for 2-3 minutes or until just lightly fork tender. 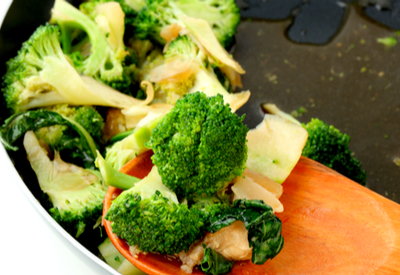 Remove the lid and add the garlic and ginger mixture to the skillet, stirring to coat the broccoli pieces. Add the beef back into the skillet and toss to combine. Whisk the prepared sauce one last time, then add to the beef and broccoli mixture in the skillet. Continue to cook, stirring constantly, until the sauce has thickened, and the beef is cooked through. This will take about 2-3 minutes. Transfer to a large serving platter and sprinkle with the green onions (optional). Serve over warm rice or cauliflower rice.